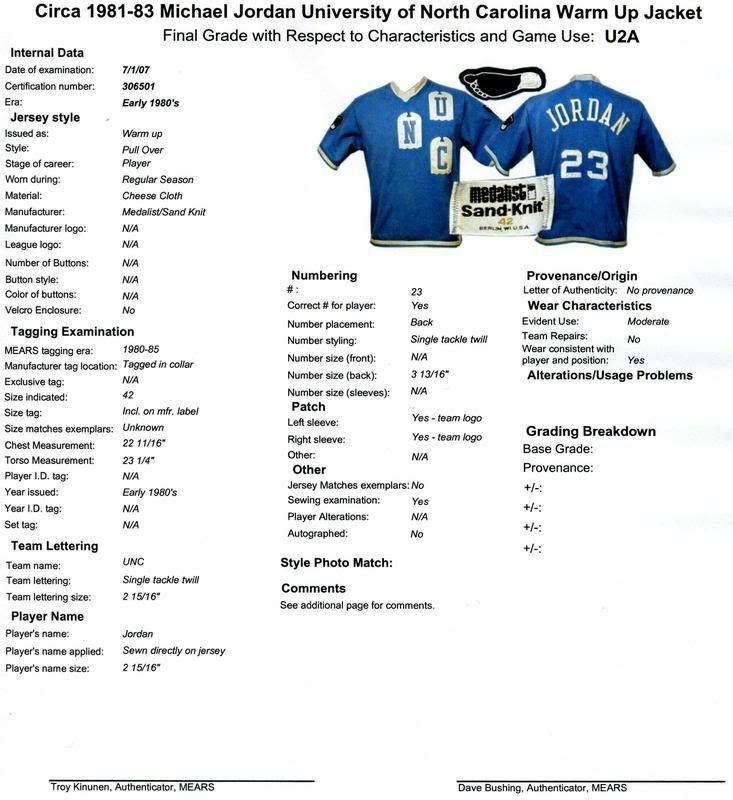 Mastro sent MEARS a Michael Jordan North Carolina shooting shirt to examine and they called it "Unable to Authenticate" because of various issues including a name change which was discovered when put under a light table. If this is the same item, there is no mention of the mears letter or the name change in the mastro item description. If it's not the same item, it's an incredible coincidence. 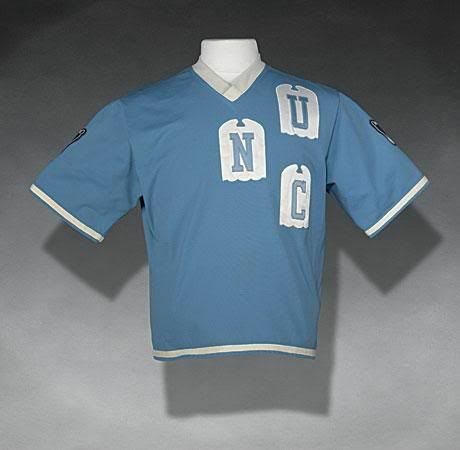 A light-blue knit pullover garment, the shooting jersey features "U," "N" and "C" block characters vertically arranged near the left breast, with the letters sewn in blue tackle twill to white, tablet-shaped twill designs. 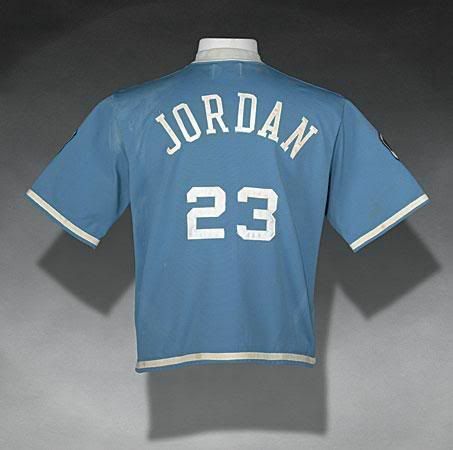 On the back, "JORDAN" is arched above his famed "23" identifier in white tackle twill, while "Tar Heel" foot-shaped logo patches adorn the sleeves. 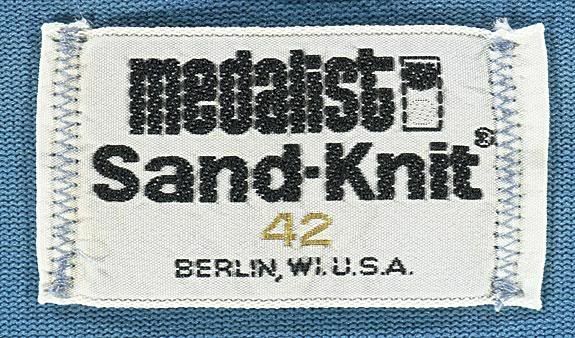 White trim lines the V-neck, tail and sleeve endings while, within the collar, a "Medalist - Sand-Knit" manufacturer's label denotes size "42." Moderate wear is evident, with minimal fading throughout and some puckering about the numerals on the back. With extensive and obvious game use, this is one of the very few surviving North Carolina Jordan artifacts that can clearly be deemed authentic. LOA from Lou Lampson. Emails to Mastro have yet to be returned. When they are, I will report what they say. There is also a Ted Williams jersey in the current Mastro auction that Mastro submitted to MEARS which was deemed unable to authenticate. That one is still being sold in the live auction, but the difference between that and the Jordan shirt is, in the item description for the Williams- it is acknowledged that MEARS had problems with the shirt. There is no mention of the alterations on the Jordan or the MEARS rejection. "In summary, due to the manufacture of the sleeves, application of the chainstitching, and additionally noted irregularities, MEARS was unable to authenticate this jersey as a 1954 Ted Williams Boston Red Sox road jersey. The set in sleeves and two hole buttons were more consistent with pre 1940 Red Sox road jerseys which did not match the 1954 year tag on this jersey and predated the year this jersey was supposedly issued to Ted Williams. Final Grade: Unable to Authenticate"
in the Mastro description of the Williams jersey it reads, "By MEARS' own acknowledgment, a discovery of photographic matching, in tandem with the provenance in the jersey's favor—originality, McAuliffe's documented instances of variations, and collarbone-resultant adjustments—would be grounds for MEARS authentication." Does that even mean anything? If I submitted a #2 Yankees jersey with "Jeter" on a nameplate on the back, MEARS would call it "Unable To Authenticate" but I could say the same thing. If I was able to unearth a photo of Jeter playing in a jersey like this, that would be ground for MEARS authentication. This is a ridiculous thing to say. MEARS came up with reason after reason of why the Williams jersey didn't match exemplars. But Mastro seems to be spinning it, suggesting "But if a photo of this DID exist, it would be the real deal, right?" The Vintage Baseball Forum folks from network54 have picked up the story too. They had an extensive thread about Mastro admitting to restoring cards and not mentioning those changes in the item descriptions. I still have not heard anything back yet from anyone at Mastro. I will let you know. I got an email from someone saying the Jordan shooting shirt is not on display with the other mastro items. Can anyone at the National confirm this? After their career was over, Carolina players were allowed to keep their jerseys and warm-ups. "Recycling" was not done. The MEARS letter speaks for itself. Let's hope Mastro learned this, and then ended the auction. Lampson wrote a LOA for Mastro, but see folks- Lampson does not know what he is talking about. I realize Lampson does not write the text of his LOAs, he just signs off on them. Lampson is a scape-goat and should hold his head low, with his shoulders slumped. He is a menace to collectors throughout the world and to everything decent and holy. the jordan shirt closed at $11k. i wonder if the winning bidder was made aware by mastro that mears was unable to authenticate the shirt. so does that mean that mastro violated the contract? while doug allen calls mears "the esteemed authentication service", it's not hard to see why dave grob fails to return the love and has publically stated that as long as allen is in charge, not only will he not do any work for them but he won't even bid on an item. - some of the network54 folks have mentioned that it may be a JV shirt. "In lieu of this, Mastro Auctions confidently stands by the jersey's authenticity on the basis of our analysis and our extensive experience and expertise handling the hobby's most elite and expensive game-worn uniforms." if mastro apparently has their own in-house team of aces whose opinions override mears, then why did mastro bother hiring mears in the first place? from what it sounds like, mastro has all the expertise and experience needed so i fail to see why they shelled out the money to hire mears. or does their expertise only come in to play when mears rejects a $29k jersey? anyway, the williams jersey closed at $29k. If Mastro did not inform the winning bidder of MEARS' findings, then, that is damn shady. Yes, Lampson doesn't do research and his opinion is worthless. But if Mastro kept MEARS' research hidden, then that is criminal. The real scoop of this story would be if Lampson was made aware of the MEARS research and the "unable to authenticate" letter. Mastro obviously knew. It seems Mastro could find some credibility in MEARS' reasearch. If you can't find it in your heart to do "the right thing"...for God's sake, don't do "the wrong thing". I had emailed teh UNC basketball office last week about this shirt asking if they could shed any info on it and this is the reply I received directly from the UNC basketball office. We checked with our equipment manager and this is what he said in response to your email. "Jordan has his shooting shirt and no , the JV team has not worn shooting shirts in the last 26 years that I have been here". I've read some of your posts on the network 54 forum. I'm glad you shared this information with the forum. Last year, Lampson authenticated a Darrell Griffith Louisville jersey. A forum member contacted Louisville's athletic department who spoke directly with Griffith. Griffith said it wasn't his jersey. Lampson was made aware of these findings. Lampson stood by his opinion and LOA. 11Gs for a psuedo-Jordan? My Ranzino Smith shooting shirt seems more appealing than ever!